We are now a decade into the explosion of living or green walls. There have been many successes and some notable failures along the way, some of of which may be system-induced and some caused by inadequate or inappropriate maintenance regimes. Assuming we now have systems that work at least reasonably well, what is required by way of maintenance to keep walls looking good? First of all, we have to acknowledge it is the large, commercial projects which get the attention and sit within the public eye. If anything goes wrong with these, it is noticed, big time. Commercial walls, I have found, are governed by financial pressures and that can sometimes mean that over time, budgets are cut and maintenance regimes compromised. 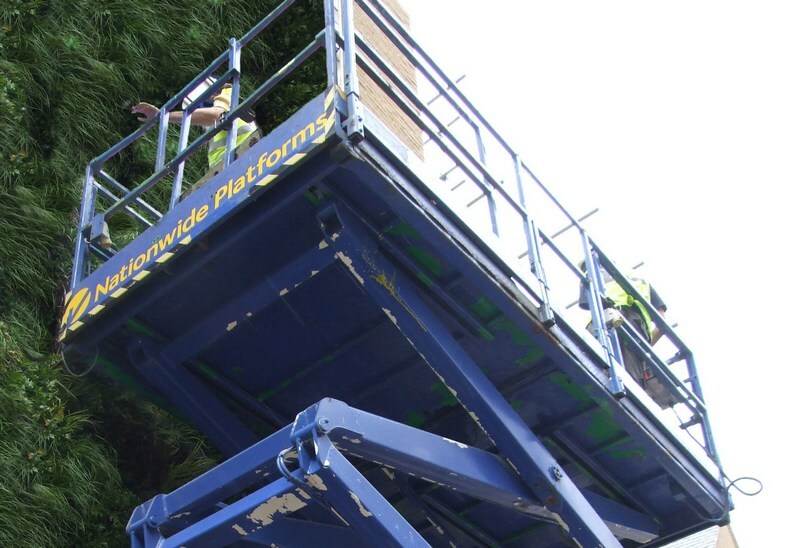 When maintenance goes out to commercial tender, it is usually the cheapest price that wins. Secondly, we have to understand that there is a profound difference in the way we perceive vertical landscapes from horizontal ones. With ordinary planting beds, we would plant probably between five and nine groundcover plants per m². 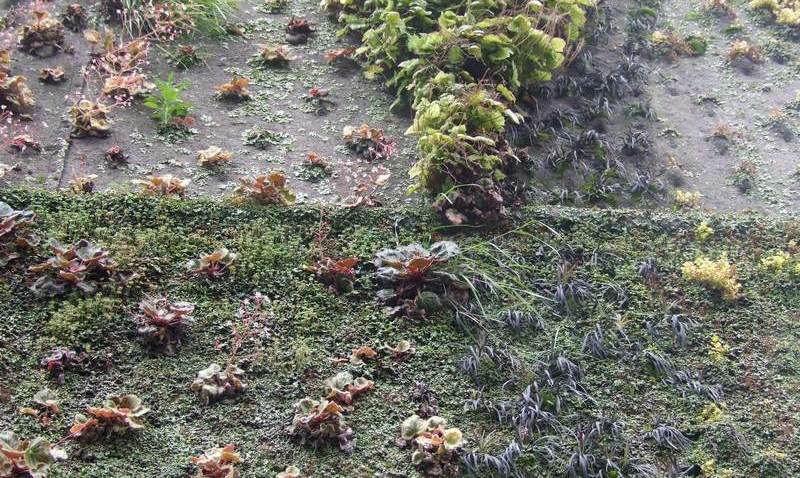 Living walls are planted at between 30 and 100 plants per m², a highly artificial and crowded environment. Yes, we are treating these as groundcover which knits together, but unlike horizontal beds, gaps between plants are not deemed acceptable. It is also harder for plants to spread or fill in laterally, depending upon the system they are planted into. 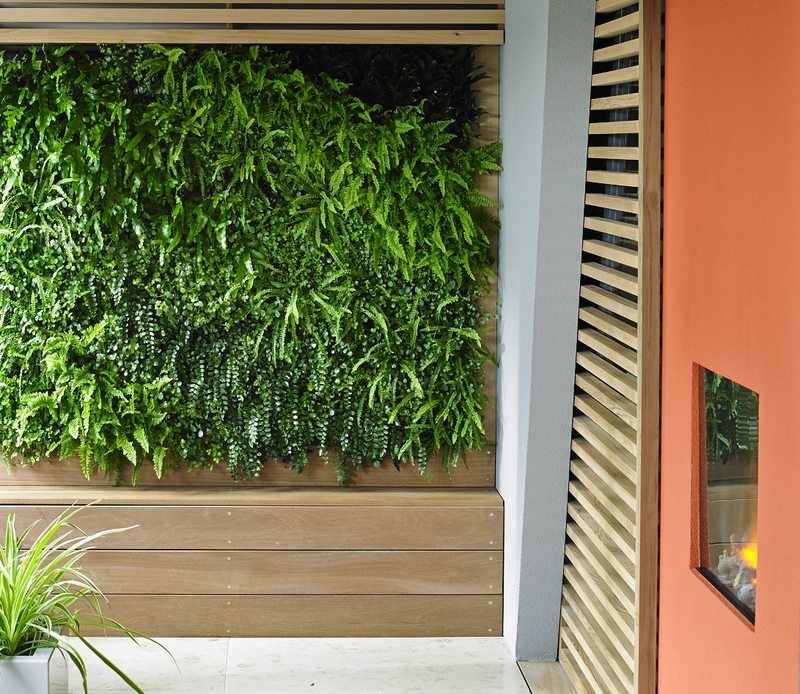 Visually, when you look at a living wall, you look straight on at eye-level, then upwards. So the lower sections of walls can come under intense scrutiny. Any failures have to be replaced and the rate is higher than that of horizontal planting, for the aesthetic reasons just stated. Thirdly, living walls depend upon the right plants being chosen; they have to have the right characteristics of habit, growth and longevity. Some common garden plants are notoriously temperamental, short-lived or subject to pests such as the notorious Vine Weevil (which seems to attack an ever-increasing variety of plants). As a designer, I have previously used many plants that I don’t use now, and I find the list is shrinking, as you learn about a plant’s ruggedness over time. We are still pioneering a new methodology and now I’d rather use a smaller palette and feel more confident about it’s long-term success. 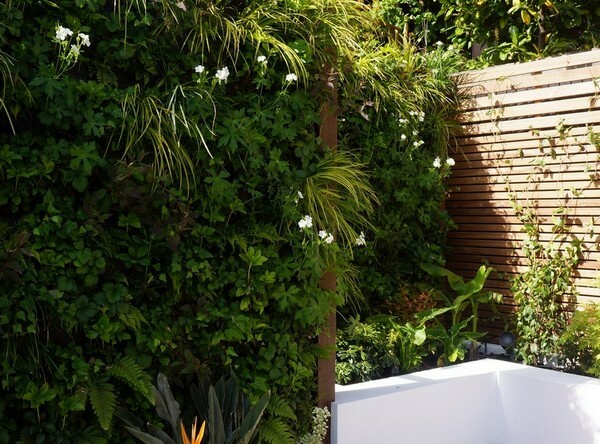 Fourthly, finally and perhaps of greatest importance, is the maintenance given to a living wall. I prefer the term living wall to green wall, because it reminds us that they are just that, living. They are also put into an extremely hostile and unnatural location and aspect. Sometimes those who look after them don’t do a good enough job. Many commercial landscapers are not horticulturalists and don’t really know that much about plants. That may sound shocking (and I’m pointing fingers at no-one, for this is just they way things are) but a Kew or RHS trained gardener is unlikely to be employed in a commercial company. Even knowing what to do for the best health of a plant on the ground could be inappropriate if done to the same plant on the vertical. The pics above show living walls in three different systems, all in poor condition (including one using my older system); I’m not saying where or who because blaming is not appropriate nor my intention; rather, awareness raising is. The fact is that each and every system out there has good and bad examples to show. It is interesting to note that training efforts have been begun in at least one university, but this type of knowledge is a hands-on, college affair. Right now, it is only learnt on the job and this is art of the problem; many operatives simply don’t know their plants. If you don’t know the name, you’re not going to know anything about how it grows or when and how you should prune it. My answer (and this goes much against my designer instincts) is to restrict the planting palette to those most able to survive. I always want to use more varieties, but it is sobering when you see them dying because they can’t cope with the conditions, or falling off the wall because the roots have been eaten by Vine weevil or millipedes. Beautiful grasses that have high levels of old, straw-like debris among the new healthy leaves are a no-no and geraniums may or may not look good in the winter months; such plants must be used with care. Patterned designs seem to fall by the wayside too; bold swathes are fine until one species fails and dies back, then you are left with a gaping wound. So you may be thinking, should we do this at all? My answer is an emphatic yes, we should and must. We need to green the vertical in cities, for it is often the only space left available. 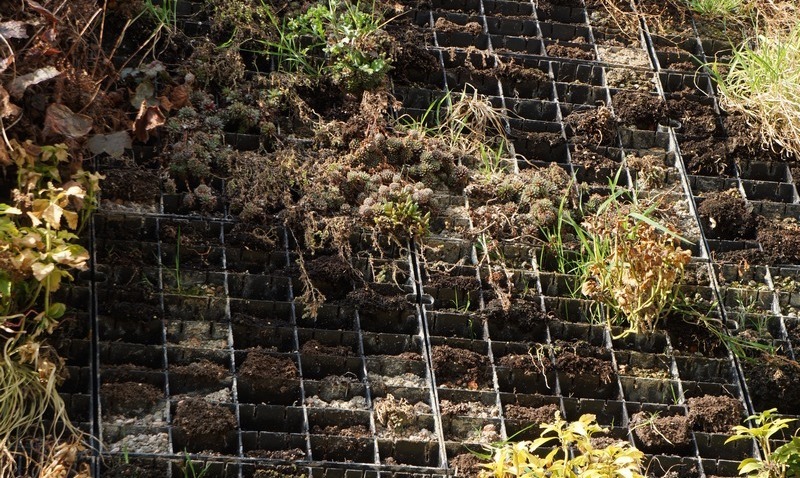 We have all the needs of biodiversity, pollution mitigation and biophilia to account for and living walls provide those where no other greening method can – not even trees. We still have much to learn however, and the skill of maintenance has to be appreciated more by all involved. In fact it needs to be venerated and it’s practitioners respected and paid more. Systems, at best second or third generation, need to evolve and be better understood. Or rather, plants need to be understood more, and their optimal needs met. We have, as I keep saying, hardly scratched the surface of what is possible and of what needs yet to be done. We need to learn more, try more and expect more. There is something incredibly exciting about living walls. Stacking green plants on the vertical plane on buildings, where you’d think they just should not be, goes against the odds. Yet nowadays they are almost commonplace, and most people have encountered one somewhere. They cling to life with extraordinary tenacity, usually in a growing medium only a few centimeters thick, with water fed via irrigation pipes. Cynics may criticize and some walls are without doubt better designed and maintained, or use a better system than others, but we should applaud this urban green trend, and encourage it. We need it. Modern systems are reliable and use very little water or energy to run. As a global society we are going through unprecedented changes; now more than 50% of the world’s population is urbanised and this will grow to 75-80% by 2050. Most of those people are essentially disconnected from Nature. It is now recognised that we have an innate need, called biophilia, to maintain our relationship with Nature. Not surprising really, when you think how we have evolved, yet the psychological and physical cut-off, over the last 100 years, has been astonishing. This can only become more pronounced as cities continue to swell, and highly-stressed people produce dysfunctional societies. If we can green our urban streets then perhaps we can counter this negative effect. Green walls take up almost no footprint in the urban landscape, not even a pavement width. All that is needed is a supporting wall and we have plenty of those. Trees are beautiful and add huge amounts of biophilic interaction into a citiscape, but we find them increasingly difficult to site, due to underground services and growing space needed. Those of you who read my blog will know that I also consult on trees, so I love them dearly, but I see living walls as having a different role to play and as being more versatile. 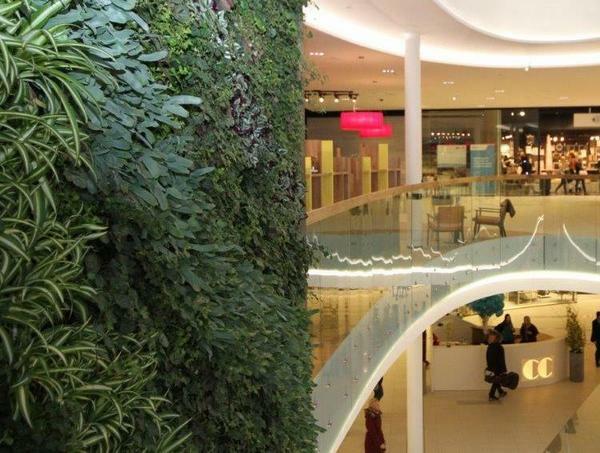 Living walls have physical benefits on the environment too. They provide a haven and food source for insects, especially bees. Birds find seeds, berries and of course, insects on the wall and smaller birds are known to nest amongst the foliage. Living walls are also helpful in mitigation of air pollution; I was involved with designing and plant selection for a wall put up by Transport for London (top picture) to test the ability of plants to capture pm10 – airborne particulates, primarily from diesel engines. Whilst we need to remove the source of these pollutants, capturing them is a good secondary strategy. It turns out that walls in a street canyon (where the building height is greater than the street width) cause the air to move in a cyclical manner, so air passes through the foliage of a living wall several times. Trees can do this, but dense canopies can actually trap particulates down at street level, concentrating them where people are. Most trees also are deciduous, so have no such benefits in the winter months. We can bring living walls into the interior, and in fact in hostile climates, that’s where you’ll find most of them. Whilst I have designed outdoor walls in climates as diverse as Dubai, Norway (Trondheim, 62° latitude) and Chicago, in such places it is often easier to put your dose of biophilia indoors! We spend 80-90% of our time inside, so this makes sense. Such walls also clean the air. Much quoted studies by NASA have shown that a range of common houseplants (which are basically plants of a sub-tropical origin) are efficient at removing Volatile Organic Compounds VOCs, such as formaldehyde) from the air. These can be found in concentrations far higher than outdoors, due to the nature of air recirculation and energy conservation. So we bring the jungle indoors, where we live and work. Walls have the most drama when they are large, but they don’t have to be. Small walls in intimate spaces still have a large impact. This can be a home, courtyard, rooftop or office reception. Small is beautiful. 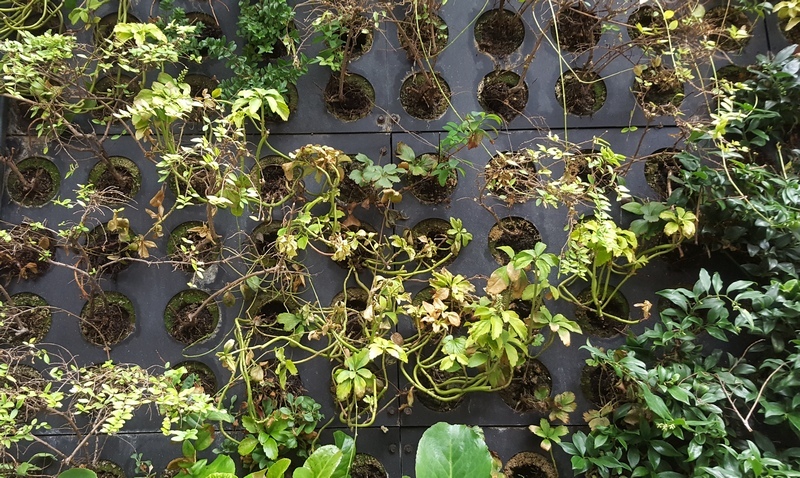 Having worked extensively with living walls over the last decade, I now consult, design and install them worldwide via my company Vertology Living Walls, and its approved partners. Grab yourself some biophilia – install a living wall! The Walkie-Talkie building, infamous for melting cars, has one of the UK’s largest green walls, to the South side of the building, facing North. I designed this wall as my last commission for Biotecture, the living wall company I conceived and co-founded. They were in turn commissioned by Willerby Landscapes. 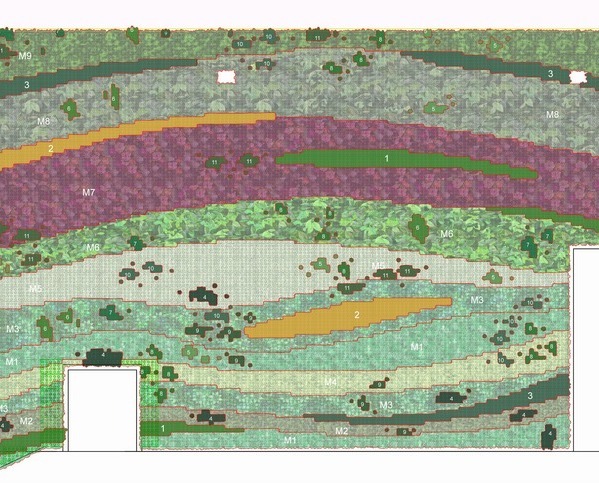 The design went through many permutations but in principal I wanted to use the wall size to create a banded horizontal wave pattern, each band consisting of a matrix of similar plant types. Some smaller areas of single-species plants were also included as these would be better defined by the contrast. Plants were chosen with a wide mix of Natives – at least 12 species – 9 groups of the aforementioned matrix planting and a number of single species groups and clumps, such as Luzula sylvatica (native woodrush) or Polystichum aculaetum (hard shield fern). The lower bands were much smaller than the upper bands, to give the best visual aspect to those at street level and to bring things to a human scale. The layout design was simple, the plant groupings and textural contrasts more complex. Time will tell if they work out as planned! Installation seems to be happening in stages, as the building works complete. the photo below was taken in July. 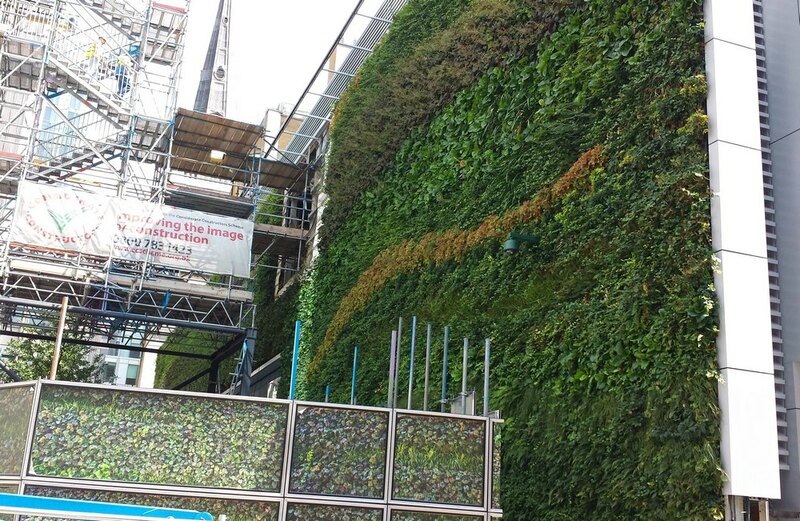 Green Walls – where next? Is there a “next place to go” for green/living walls? Absolutely there is – there’s probably two next places to go – in opposite directions, seemingly. First we have a growing need for the mitigation of environmental factors which are largely of our own making; air pollution, rising temperatures, storm and waste water management and purification. Methods of providing ecosystem services, if you like. We need these in urban areas, right at the heart of where the problems originate or concentrate. 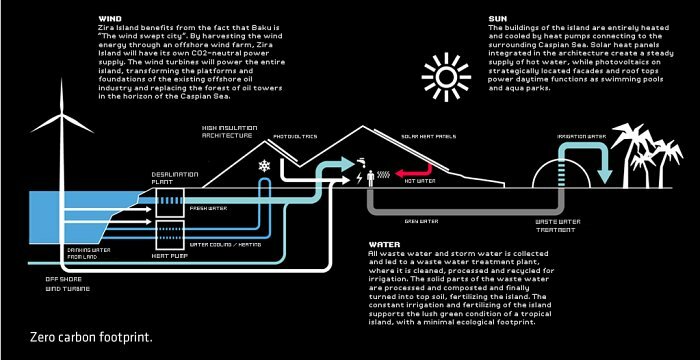 Linear, end-of-pipe solutions to things such as “waste” water (how can H20 ever be waste?) are becoming increasingly unaffordable, especially in third-world regions where the real population growth is taking place. So we need cyclical systems to deliver on-site solutions. Such systems must be cheap and effective. They will look green, be alive, but not driven by aesthetics, although that is not to say they won’t look good. But we need these types of wall to be installed an a huge scale, if they are to make a genuine contribution; with the climate changing so rapidly, we need all the help we can give ourselves. I’m working on such a system now, focusing on air pollution mitigation. Vertical greening is particularly effective in the urban environment for two reasons: we have very little open space to implement large-scale greening on, and the effects of pollution are most felt in the urban canyon – where the sides of the streets (buildings) equal or exceed the width.. Greening the sides of urban canyons, therefore, has the greatest potential for capturing particulates (pm10 is the range causing most concern). It is interesting to note that trees are often cited as being good at removal of dust and particulates – but green walls are far better. For a start, most urban trees are deciduous, so they only have leaves for seven months of the year, then there is the recently researched fact that trees in an urban canyon can actually trap particulates under their canopy, preventing the natural air movement from mixing pm10 into the larger air volumes. I work with trees and love them, so have no bias in this; we just need to understand the interactions between air movement and greening. So this for me, is the next generation of vertical greening technology. Interestingly, being next-gen doesn’t mean being more high tech. Given that things have to be cheaper, they have to be low tech but more effective. This is where understanding the effect of things is crucial. The street canyon is the best place for vertical greening to remove air pollution. I said that vertical greening developments would move in two directions; the other is for increased human interaction, for biophilia. As 80% of the world’s population will be urban by 2050, many of the projected nine billion will have little access to nature. We need to make our cities green forests – not the urban jungles they have become. 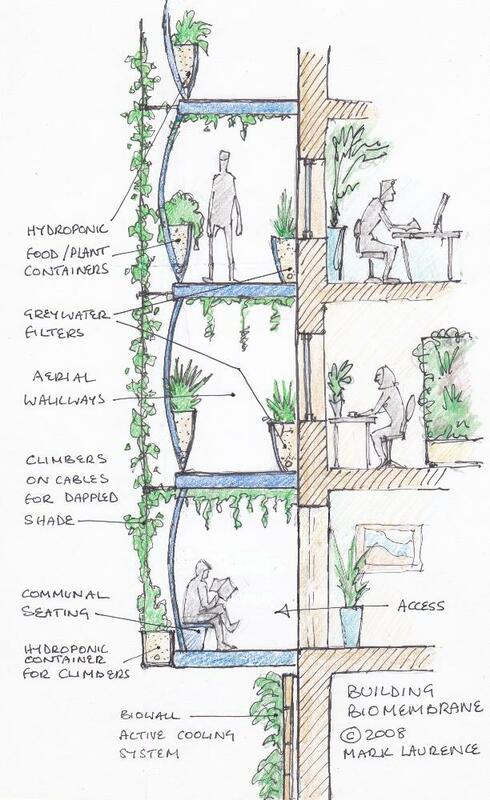 Every building needs to have vertical parks and gardens built in as standard, giving us direct contact with nature (whilst at the same time giving us all those ecosystem services I mentioned earlier), which brings the two directions (function vs beauty) right back into one place. Furthermore, such systems must be easily retrofit-able onto existing building stock. So there is a huge role for vertical greening to play for humanity, keeping us in a functioning, livable environment, giving us beauty, satisfying our need for biophilia and keeping us sane in an urbanised world. We’ve barely scratched the surface of what we can do and I’m certainly looking forward to upping my game with new products that take is in the right direction. I now run a new company Vertology Living Walls and have an advanced, patent-pending green wall system, Viridiwall™.